The long-awaited 2018 Atlas is not only Volkswagen’s newest vehicle, but it’s also its biggest outranking the 2018 Hyundai Santa Fe. The Atlas has a cargo capacity of 96.8 cu.ft. versus the Santa Fe’s 80.0 cu.ft. That means the Atlas can hold more than 16.0 cu.ft. of cargo vs. the Santa Fe. That means you and your family get more space for everyone’s stuff. And when you’re not using the second and third row seats to store cargo, you can fit up to 7 passengers comfortably. The new VW SUV leads its class in 3rd-row legroom with 33.7 inches. The Santa Fe can only hold up to 6 passengers with 30.9 inches of 3rd-row legroom. Both the Atlas and Santa Fe come close in the battle of gas mileage, but the Atlas comes out on top with an estimated 23 mpg highway compared to 22 mpg’s for the Santa Fe. The Atlas and Santa Fe offer similar safety features including parking assist, blind-spot monitoring systems and lane departure warning, but I think we both can agree, the Volkswagen wins in the ‘looks’ department. For many years Hyundai has been the industry leader in new car warranties, but Volkswagen has just stepped into the ring to claim that title. 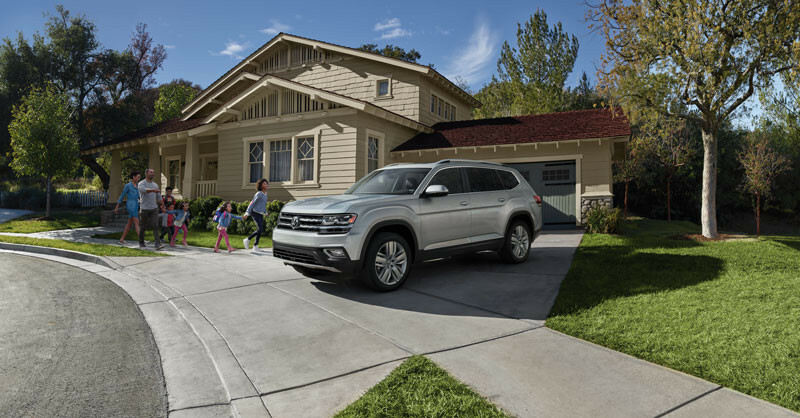 Volkswagen’s People First Warranty now offers new Volkswagen owners six years or 72,000 miles of bumper-to-bumper transferable coverage including powertrain components. Hyundais only have 5 years/60,000 miles of bumper-to-bumper coverage and it’s not transferable. So if you’re thinking about the Santa Fe, you may want to reconsider. Volkswagen has upped its game as evidenced by the slew of awards this new SUV has already raked in. Check out the all-new 7-passenger Atlas at vw.com to do a little research or visit one of our VW South Florida dealerships, test drive one, and see for yourself.